I saw a map that showed the current as an elongated oval across most of the northern pacific. Since it touches islands with little population but high levels of beach litter, plastic included, wouldn't the beach litter come from the Gyre? 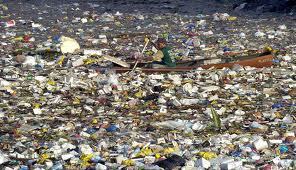 @Anonymous #2: No one knows how big the Gyre's are. The statements such as "twice the size of Texas" that are very common are not supported by strong data. That would make it very difficult to state that this plastic is actually from the Gyre. From the ocean? Sure. More importantly though, is that the Gyres are made up of numerous small (millimeter sized) particles, not large items, and that is what behind a large amount of the concern over the Gyres. The small particles are much more problematic than large items, so for Method to get good publicity from picking up large pieces of plastic on a beach (a small but visible problem) instead of filtering out small pieces of plastic in the Gyres (a large but nearly invisible problem) is "greenwashing". So useful and informative post. I think it will be so helpful for waste management.